Live multi-speaker site-specific sound-performance, scored for a turntablist manipulating digital audio and computer-assisted diffusionist. infrastructure/flow was commissioned by Michelle Browne as part of Promenade, a series of performances along the seafront in Dublin, Ireland in November 2008. 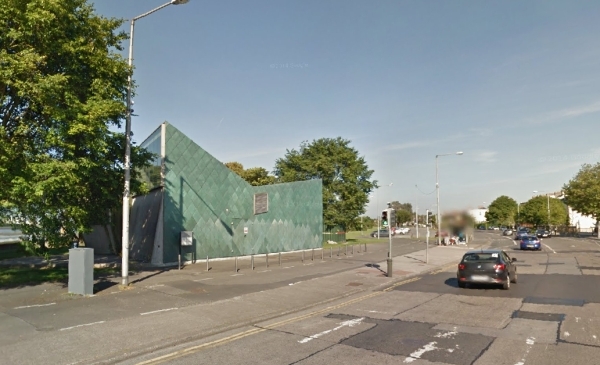 The piece was a response to a specific venue, the pump house at Clontarf, which was designed by Tom de Paor. The interior of this award winning structure houses machinery to pump waste water from the surrounding area to a treatment plant further up the coast. It is usually inaccessible to the public. The performance took place in the evening and inside the pump house it was quite dark. The only light came from a window near the roof of the building and from a grating in the centre of the floor, through which the pumping apparatus was visible. The pumps were in operation throughout the performance in response to the heavy rain outside that night and the sound of their work was a powerful physical presence in the semi-darkness. 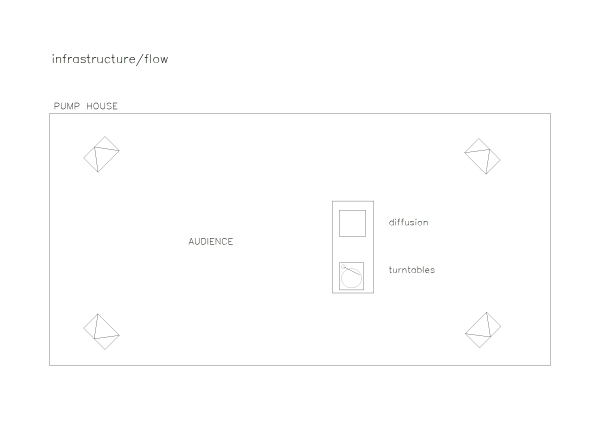 infrastructure/flow acted as an audio accompaniment to the experience of being inside this machine. One performer generated a flow of sound by manipulating records on a turntable. Four speakers were placed in the space marking the corners of a square and the sound was panned from one speaker to another, so that it seemed to move through space, flowing in through one wall and out through another. The other performer choreographed the trajectories of these sounds using custom computer software. The audience was located in the centre of this quadraphonic speaker set-up, at the heart of the machine, where the sensation of spatialised sound was most pronounced. The piece was performed four times that evening with each performance lasting about twelve minutes. 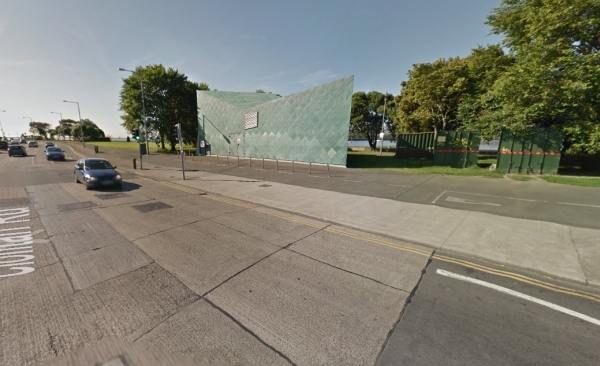 The pump house at Clontarf, Dublin.